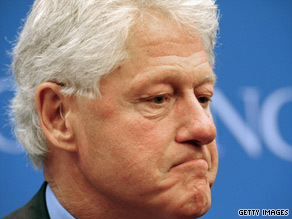 Bill Clinton: World system is "unstable, unequal and unsustainable"
WASHINGTON (CNN) -- Former President Bill Clinton urged people to accept themselves and others in a world system that is "unstable, unequal and unsustainable." In a speech on Saturday, former president Bill Clinton urged people to embrace who they are. Clinton gave the keynote address Saturday to members of the American-Arab Anti-Discrimination Committee in Washington. The organization gave the 42nd U.S. president its global leadership award. The world is an "interdependent" system where an event in one country, such as an economic collapse, can affect the entire globe, Clinton said. The former president said recent events such as the swine flu outbreak prove the system is unstable. Inequalities in health care worldwide show the system is unequal and recent trends in global warming show it is unsustainable, Clinton said. Global cooperation is crucial for the survival of mankind, he added. "If we have a chance, it has to begin by people accepting that they can be proud of who they are without despising who someone else is," Clinton said. To foster this cooperation, people should focus on their similarities because we are genetically "99.5 percent" the same, the former president said. "From time immemorial, people have fought over identity rooted in that (half percent)," Clinton said. "We should have spent more time thinking about that other 99.5 percent of ourselves." Clinton also urged the audience to embrace who they are. "You teach your children their ethnic heritage; their religious heritage; their cultural heritage with no negative reference to anyone else because it's the only shot we've got to make the most of our interdependent world," he said. The American-Arab Anti-Discrimination Committee was founded in 1980 to protect the civil rights of Arabs.